Alabama isn’t known for fantastic schools, but state districts have improved dramatically in recent years as funding has increased. While Alabama’s still a long way from the top state school systems, its best districts outperform even average ones in most states. Alabama offers a mix of urban, suburban, and rural school districts. Districts close to metropolitan areas, like Birmingham, tend to benefit from higher funding. However, for those avoiding city life there are still high performing districts in suburban and rural areas. Mountain Brook City is first among Alabama’s 129 school districts and located in an affluent suburb of Birmingham, with four elementary schools, one high school, and one alternative school. Test scores are high, with the average standard test score across grades, subjects, and schools well into the eighties. Mountain Brook High School performs particularly well, with an average standard score of 99.9 in 2018. The number two district in Alabama and roughly 100 miles north of Birmingham, the suburban Madison City serves around 10,000 students divided between seven high performing elementary schools, two middle schools, and two high schools. Madison City performs well. 67% of students are considered proficient readers and 72% at math. The graduation rate is high at 97%. The district is rated highly for both teachers and athletes (third in both within Alabama). Advanced Placement (AP) courses and Gifted Programs are available. The following contributed to the ranking: number of students (K-12), graduation rate, teacher quality, school funding, student to teacher ratio, standardized test results (reading and math; the percentage of students scoring at or above state proficiency level). Data from a total of 10,728 school districts had sufficient values for the variables above. Did your district make the list? Share the good news! Arkansas has historically performed very poorly among American states in education, with underfunding, frequent political meddling in curriculums, and poverty all contributing factors. However, just as in Alabama, recent reforms are improving the situation along with funding increases. Arkansas has been praised repeatedly for its efforts to improve early-childhood education, and college and career readiness. Top in Arkansas, Haas Hall Bentonville - or Haas Hall Academy - includes only the academy itself and serves around 300 students of grades seven to twelve. Haas Hall Academy students frequently score excellently in standardized college admission tests (ACT), particularly in English (97.4 average in the 11th grade). The location in Bentonville, the home of Walmart, means graduating students can expect to find jobs relatively easily. At number two and sharing the city of Bentonville, Bentonville Public Schools district has five elementary schools, five junior or middle schools, and one high school. The district is also number one for student athletes in Arkansas This highly rated district has achieved averages of 65% reading proficiency, 58% math proficiency, and a 91% average graduation rate. The teacher-student ratio is also better than the national average (17:1), at 15:1. Located to the northeast, the state’s third best school district - Valley View School District - is centered on Arkansas’ fifth largest town of Jonesboro (population around 71,000). With a good 15:1 teacher-student ratio, Valley View delivers a safe learning environment across two elementary schools, and single junior and high schools with 74% reading proficiency, 67% math proficiency, and a 95% average graduation rate. Graduates may take advantage of ample local opportunities in manufacturing, agriculture, and medicine. Arizona has impressive graduation rates in certain districts and it’s possible to find schools with above average test scores. 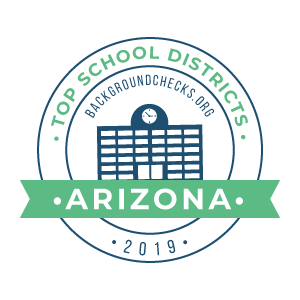 Chandler Unified District 80 is the top Arizona school district centered on Chandler, a suburb of Phoenix, serving around 42,000 students through thirty elementary schools, six middle schools, and seven high schools. Although the teacher-student ratio of 20:1 is slightly below the national average of 17:1, the district performs well academically with 56% proficiency for reading, 57% for math, and an impressive graduation rate of 94%. Deer Valley Unified School District in Phoenix is Arizona’s second highest performing district. It’s large, with thirty elementary, eighteen middle, and seven high schools with 34,153 students total. Despite its size the district provides a good environment for students, with college prep considered its strongest feature, closely followed by the sports scene. Academics here are acceptable, with reading proficiency at 54% and math slightly trailing at 51%. Further out from Phoenix, the suburban Gilbert Unified School District ranks third in Arizona. Another large district, Gilbert contains twenty-seven elementary, eight middle, and seven high schools. Nationally, the district is considered above average, with proficiency for reading and math both at 53%, but a graduation rate of 93%. The district is also recognized for its excellent college prep, health and safety, teachers, administration, and sports. As the epicenter of the tech and entertainment industries in the United States, and with a GDP that dwarfs every other US state’s, it’s no surprise that California boasts some of the best public school districts around. Let’s take a look at The Golden State’s top five. Topping the list is San Mateo County Office of Education of San Mateo County, comprised of several suburban counties along the San Francisco Bay, just north of Silicon Valley. Rather than being an individual school district, San Mateo County Office of Education presides over 23 school elementary, high school and unified districts in the county, as well as a community college district and numerous charter schools. Nearby San Francisco County Office of Education, encompassing all of the public schools in the city of San Francisco, ranks #2 on the list. Comprised of over 130 schools, students of the racially diverse district boast math and English test scores well above the state averages. Coming in third is Santa Barbara County Office of Education, a terrific district presiding over schools in what is known as the “American Riviera”. #4 L.A. Unified, the second largest public school district in the country with an enrollment of nearly 700,000, is an excellent example of a massive, yet well-run district. In all, ten languages are taught to the district’s diverse student populace. Rounding out the top five is the San Diego County Office of Education, known for its many programs providing assistance with special needs or belong to families experiencing economic hardship. Colorado is known for boasting one of the healthiest and well-educated populations in the United States, owing to the state’s physical majestic and ripe opportunity for outdoor activity, and this vigor is reflected in the performance of its best public school districts. The top district in the state is Jefferson County School District No. R-1, presiding over 100 elementary, middle, and high schools in the foothills of the Rocky Mountains. Students in the district best the state averages in the CMAS, PSAT, and SAT tests. Placing second is Douglas County School District RE-1, the third largest district in the state of Colorado. The quality of the district’s schools is shown through the high (and continually rising) 90.8% graduation rate. Colorado’s #3 school district is its largest: Denver County School District 1, serving the schools of the city of Denver. The fast-growing and steadily improving school district reduced its drop-out rate from 11.1% to 4.5% from 2006-2014. Cherry Creek School District No. 5 is the Centennial State’s #4 district. Known for attracting high teaching talent, over 79% of the district’s faculty have 10+ years of experience. In 2018, 14 of the district’s schools were named John Irwin Schools of Excellence. Closing out the top five is Boulder Valley No. Re2, centered near Boulder and serving that community, along with several others in the area. Due its frequent placing as the top district in the state academically, BVSD has earned a reputation that transcends state borders. As a state with some of the oldest communities in the United States and one of the original 13 colonies, Connecticut has had plenty of time to develop an excellent educational tradition. Let’s look at the Nutmeg State’s top five public school districts (four of five of which are located in Fairfield County) to see where this tradition is best rooted. Connecticut’s best school district is New Canaan Public Schools, a district with a nationwide reputation for academic excellence serving one of the wealthiest communities in the United States. In apt demonstration of its quality, 21 New Canaan High School seniors were recognized by the National Merit Scholarship Program in 2018. #2 goes to Darien Public Schools, a small district serving seven schools in the small, wealthy town of Darien 37 miles northeast of New York City. Students of the district frequently score the highest test scores in the state. Placing third is is another Fairfield county district, Weston School District. A small district with an out-sized reputation, Weston places an emphasis on active learning, with students participating in many activities in the woodlands surrounding the schools. The one top five Connecticut school district not located in Fairfield is #4 Regional School District #12 of Litchfield County serving four schools in the Washington Depot area. We head back to Fairfield County for #5 Westport School District, where students scored 15% above the state in the Connecticut Mastery Test. As one of the smallest states in the nation, Delaware only has 21 public school districts within its three counties, yet many of them are well-funded by taxpayers and excel in academics. Let’s have a closer look at Delaware’s top five public school districts, three of which are in New Castle County, with the other two being in Sussex County. The rank of #1 goes to the Charter School of Wilmington, which is in fact a single high school school and was the first publicly funded, yet privately operated school of its type in the United States. Wilmington is in high demand for those in the area as 99% of its students attend college post-graduation. Another charter school, Newark Charter School, places #2 in the ranking. NCS boasts an enrollment of over 2,300 students from kindergarten to grade twelve and follows the vaunted Core Knowledge curriculum. The first proper school district in the list is Cape Henlopen School District (#3) serving nine schools in the Cape Region of Sussex County. Appoquinimink School District in southern New Castle County, is #4 in the ranking. The district is the fastest growing in the state, adding roughly 600 students a year, which necessitated the opening of Appoquinimink High School in 2008. Rounding out the top five is Sussex Technical School District, again a district comprising a single school. In 2008, Sussex Tech received a Blue Ribbon award for academic achievement. Florida’s best school district is also its largest: Miami-Dade County Public Schools, with a student enrollment of over 350,000. The district’s schools regularly rank among the top in the nation, and Miami-Dade is one of the only districts in the nation to offer bilingual education and international studies programs. Placing second is Florida’s second largest school district, Broward County Public Schools headquartered in Fort Lauderdale. In 2018, graduates of the county’s schools earned $106 million in scholarships. #3 Hillsborough County Public Schools serves Tampa and other west central Florida communities. The district received a recent boost in funding and teacher mentoring through a 100 million dollar grant from the Bill and Melinda Gates Foundation, which ended in 2015. Coming in at #4 is Orange County Public Schools, which is headquartered in Orlando. The nation’s 9th largest district hit a record high graduation rate of 93.8% in the 2016-2017 school year. The School District of Palm Beach County places fifth in the ranking. The diverse student population of the southeastern Florida district speak 146 languages and dialects.